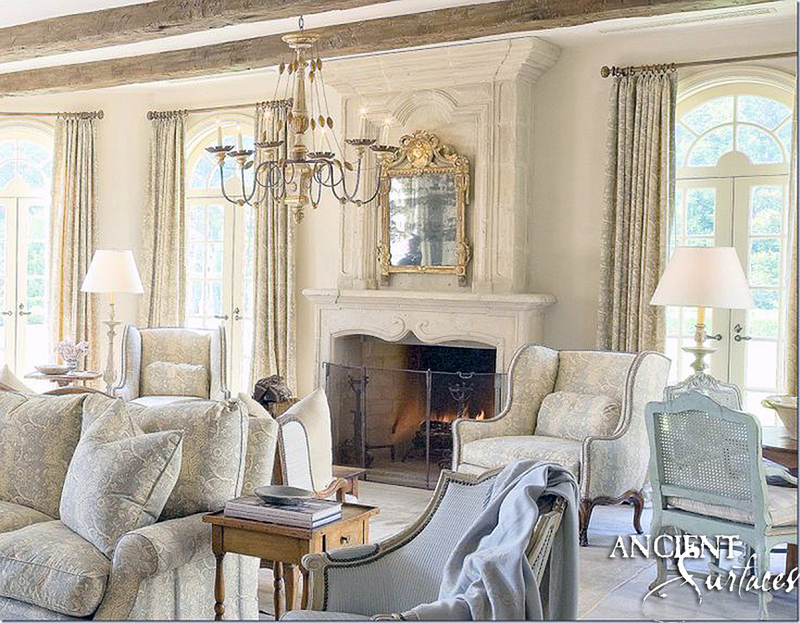 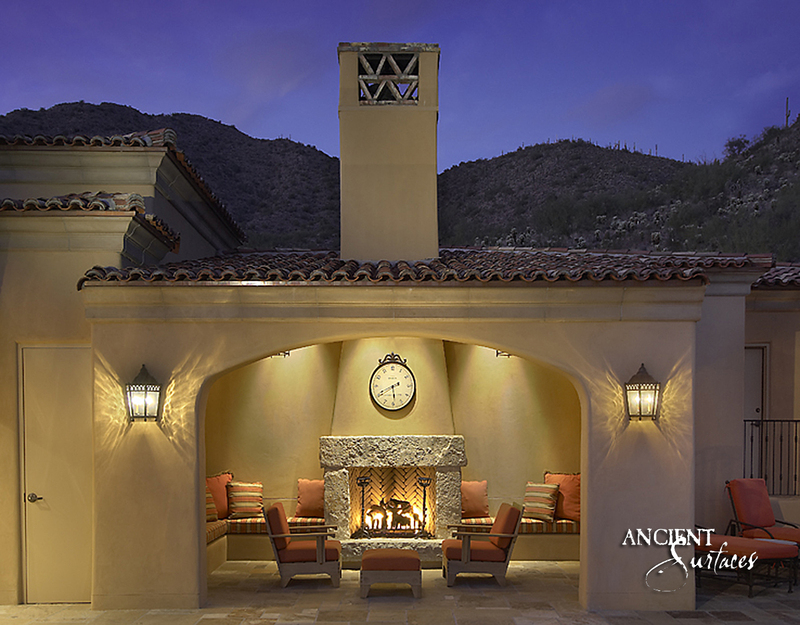 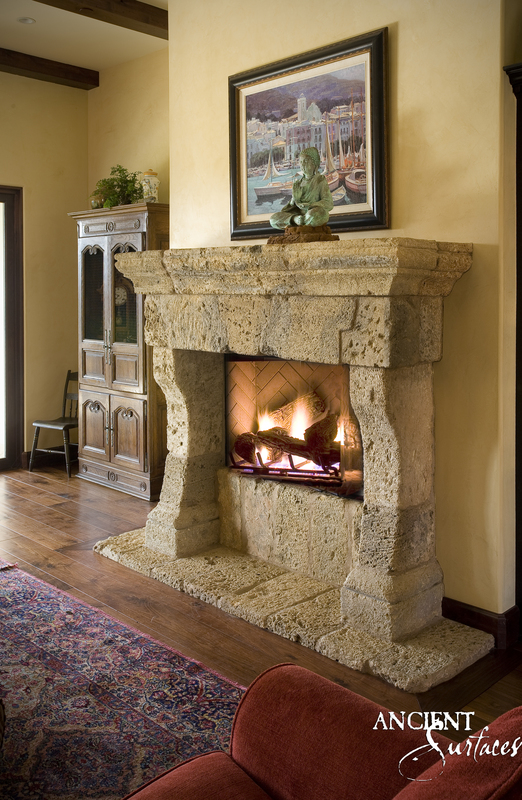 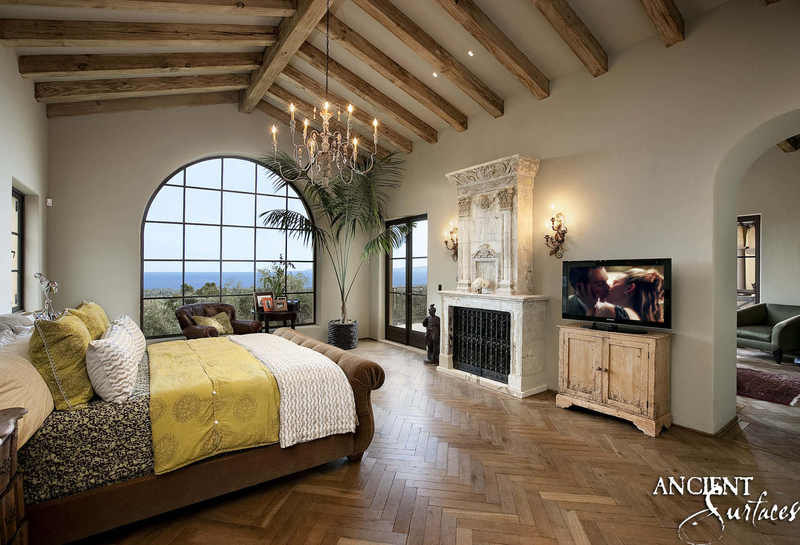 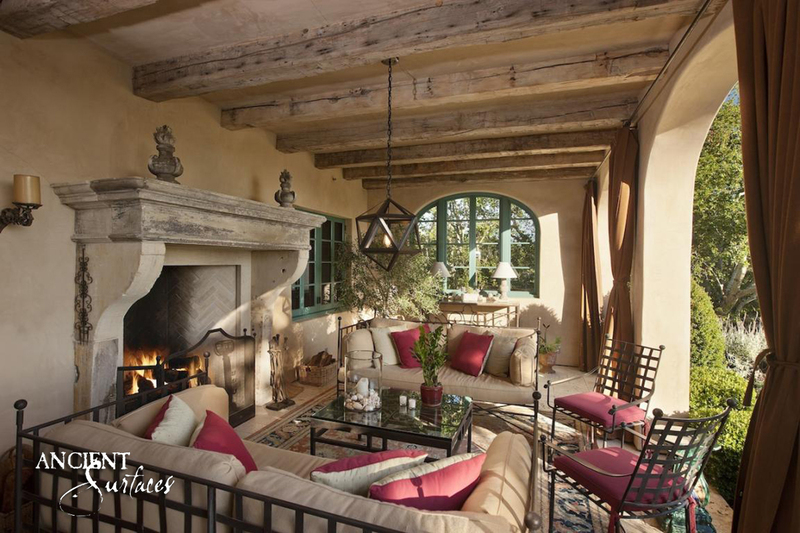 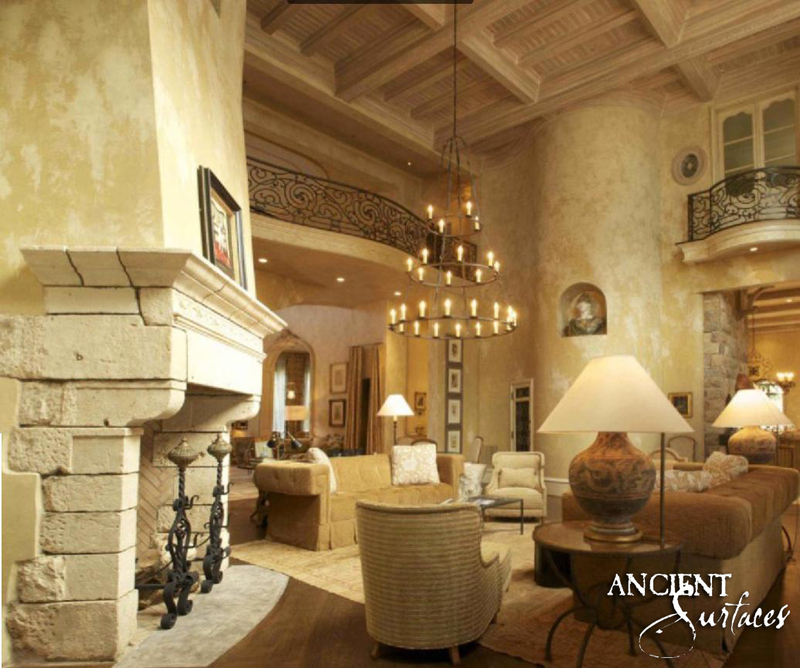 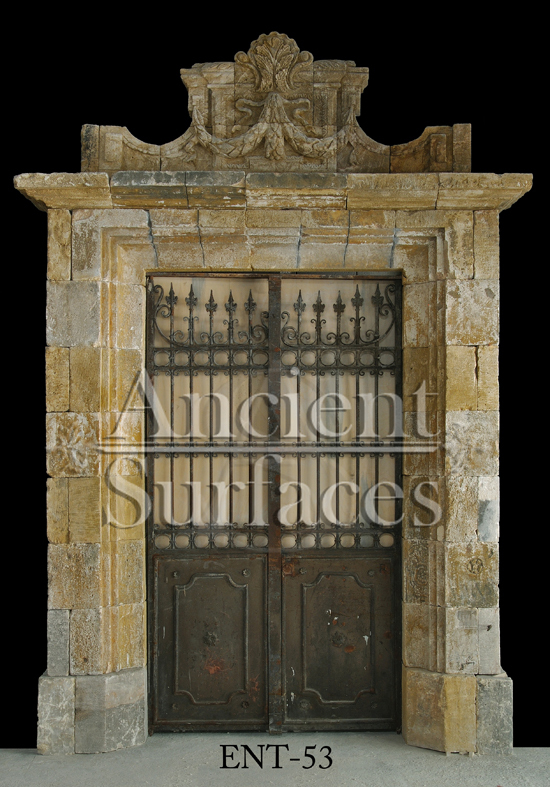 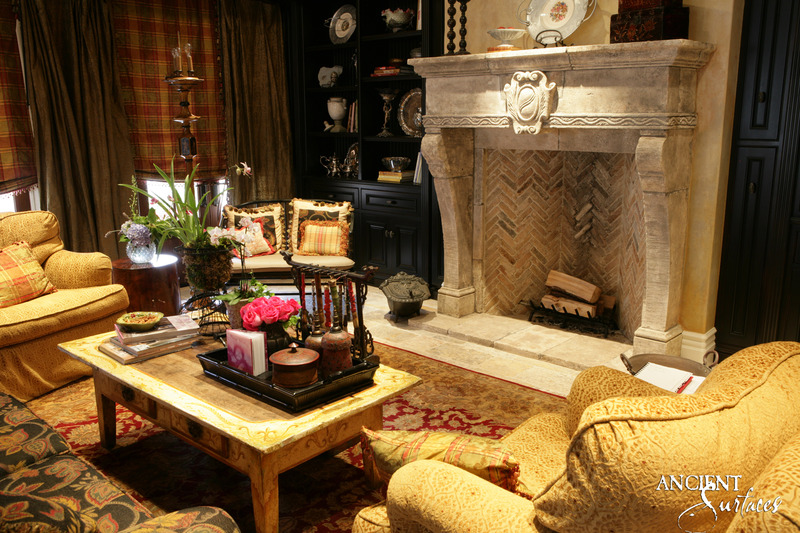 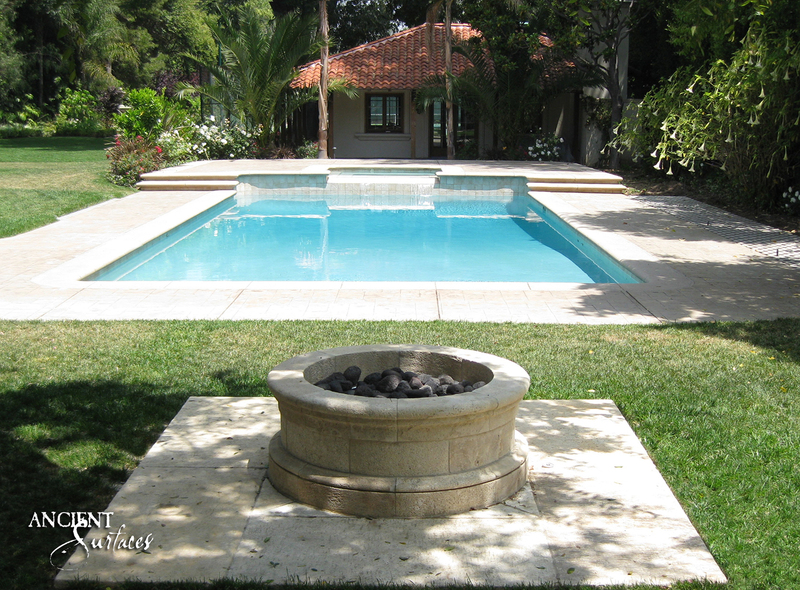 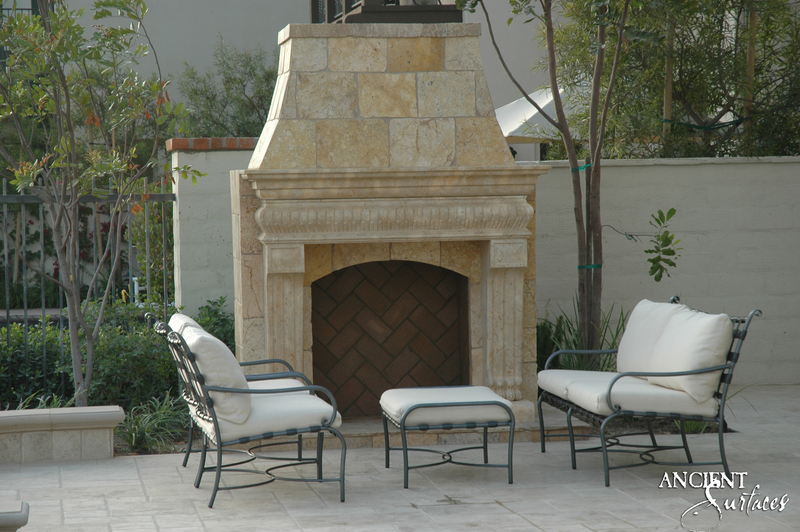 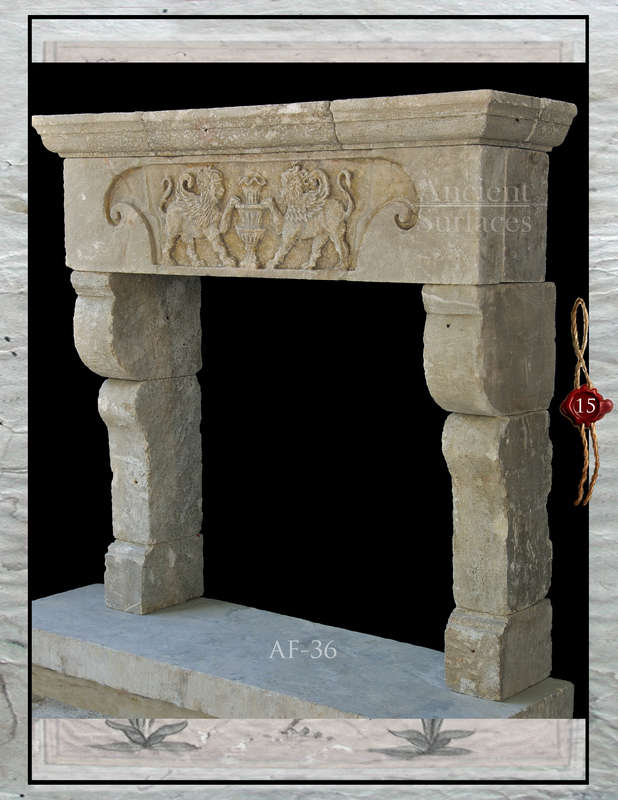 Antique Stone Fireplaces | Antique Fireplaces by Ancient Surfaces. 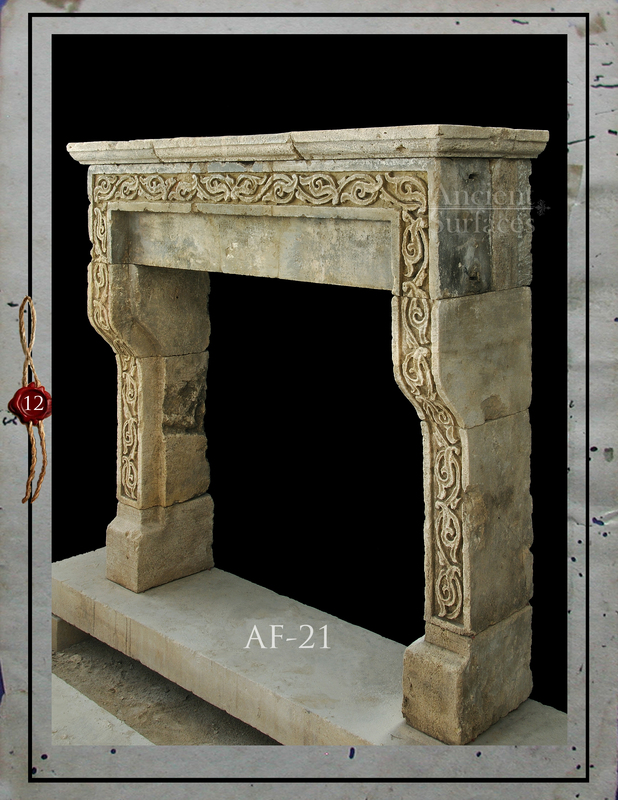 An Antique fireplace mantel is doubtless the most momentous item of furniture that you’ll invest for your house because it’s a permanent fixture that will survive and fit any of the house remodeling and endless redecoration and style changes that a home will have to endure over its lifetime. 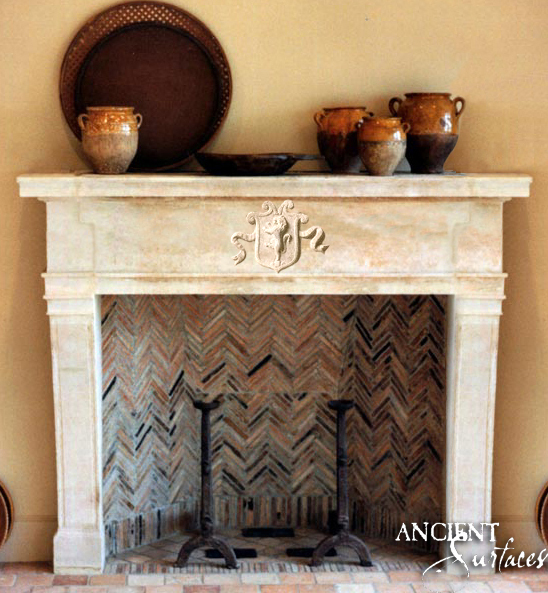 A French Mantel is identified by its quintessential finesse regardless of carving style and design period. 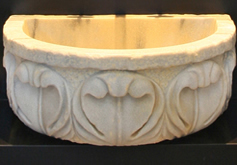 They are a bit lower and deeper than those of the Italians. 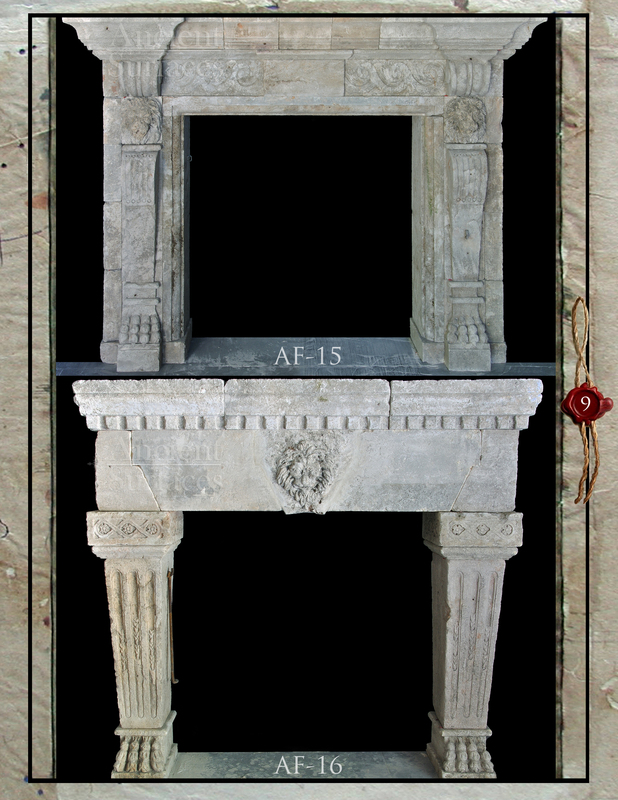 detailed coats of arms and focused more on ‘story telling’. 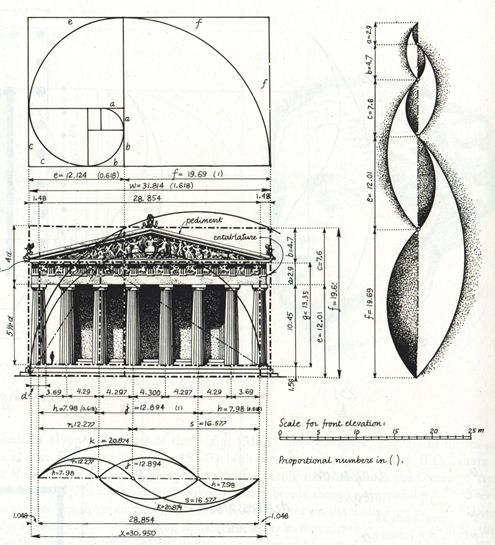 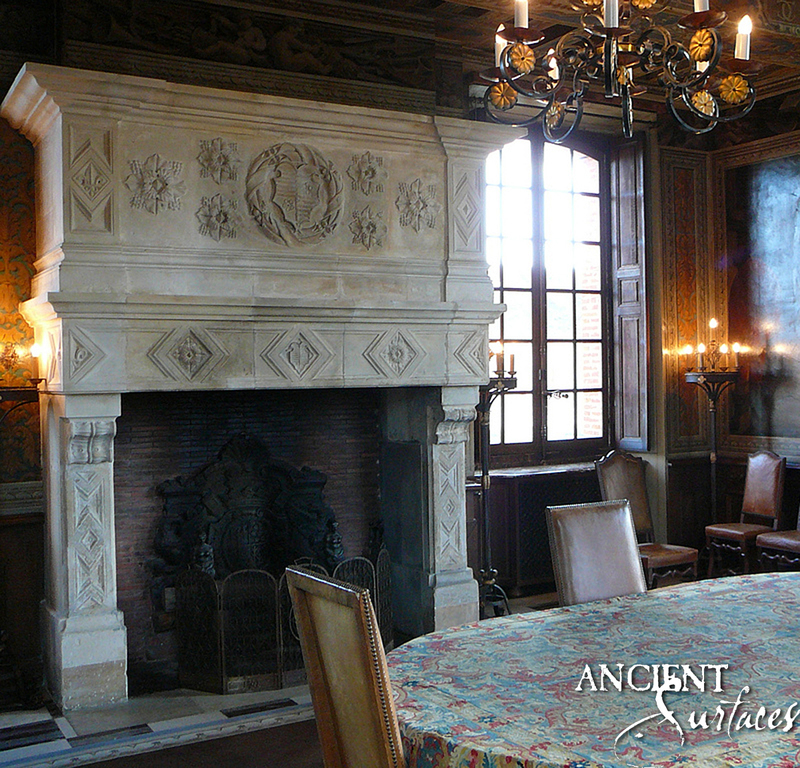 This genre of Neo-classical style came to lead during the reign of Louis XVI. 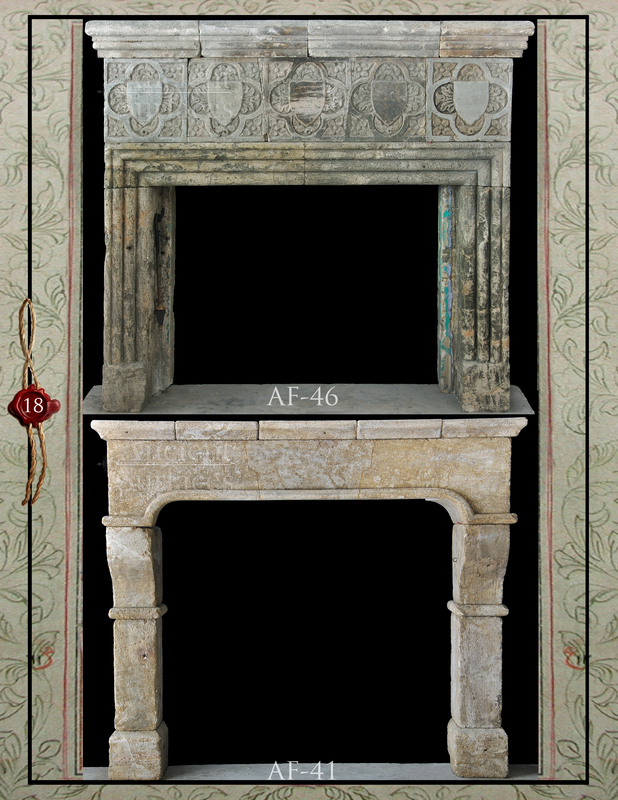 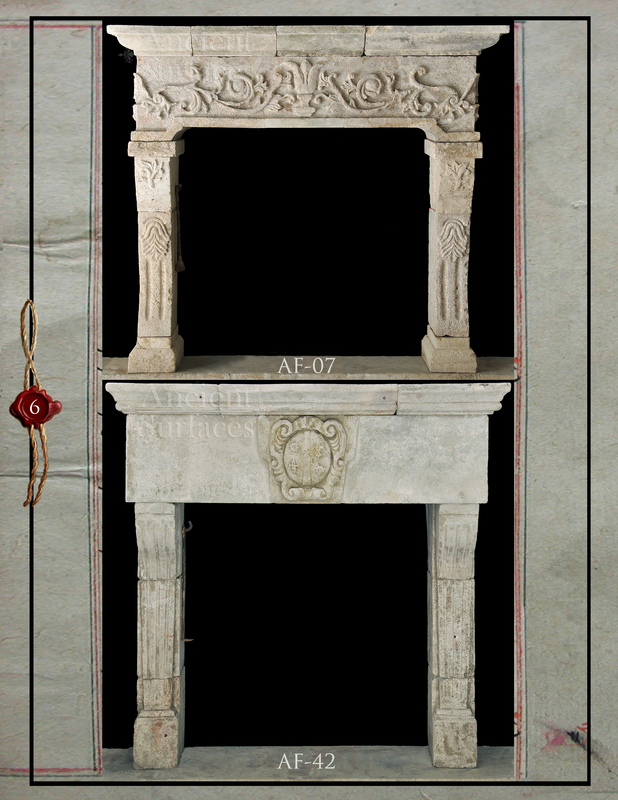 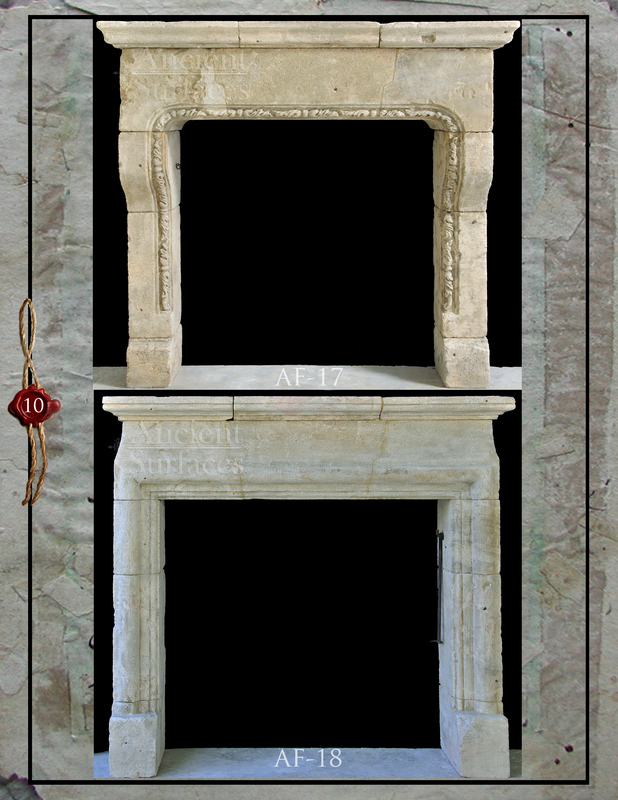 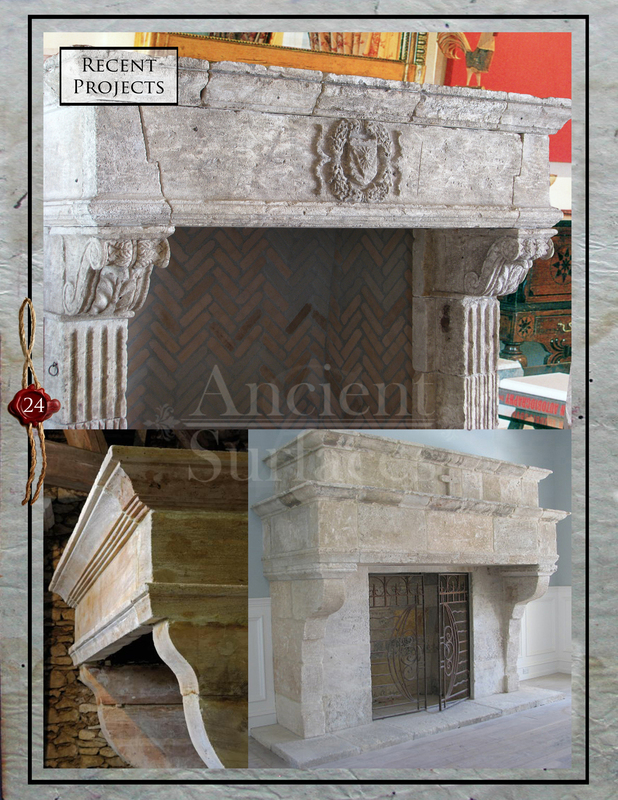 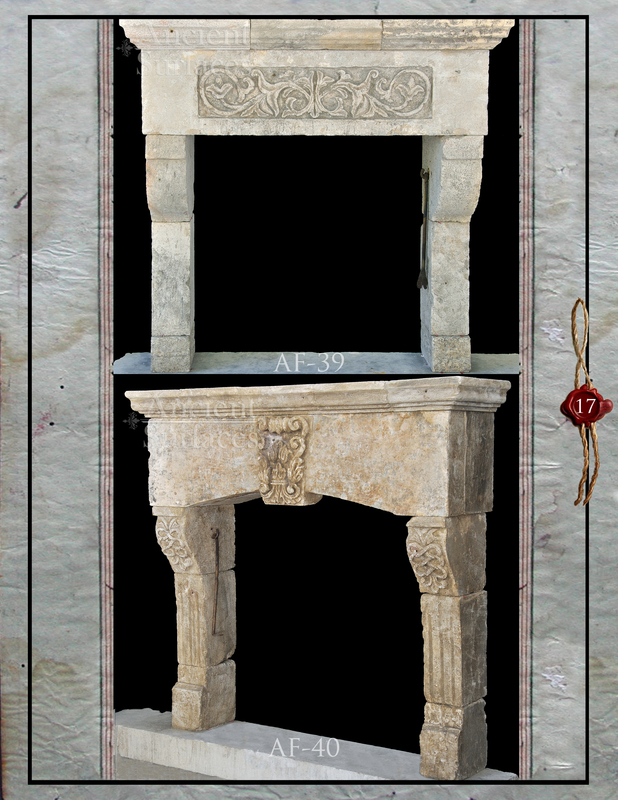 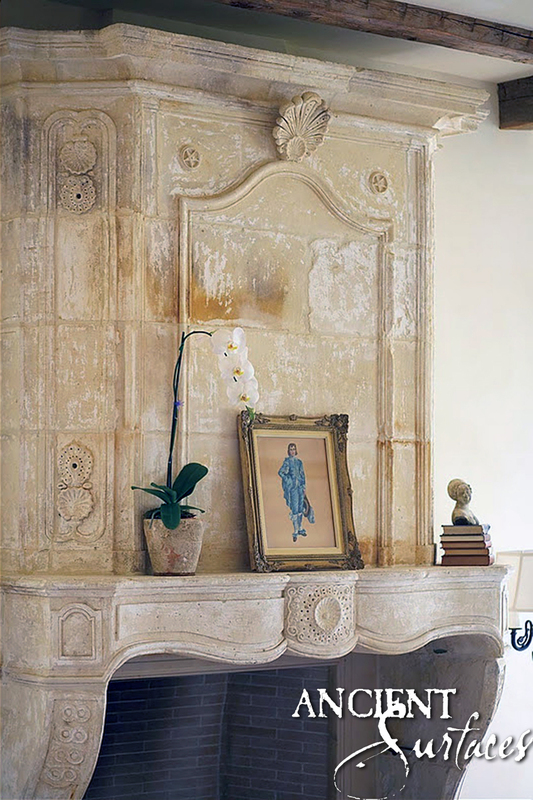 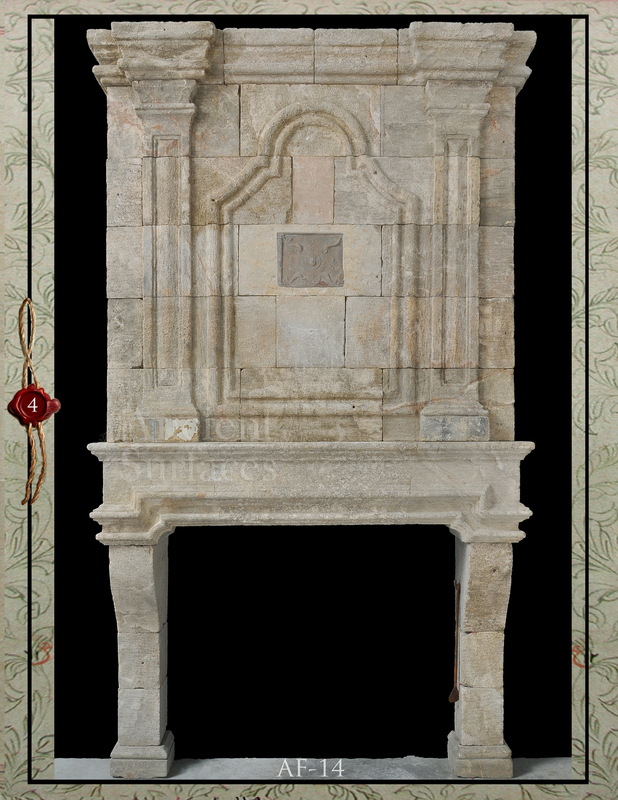 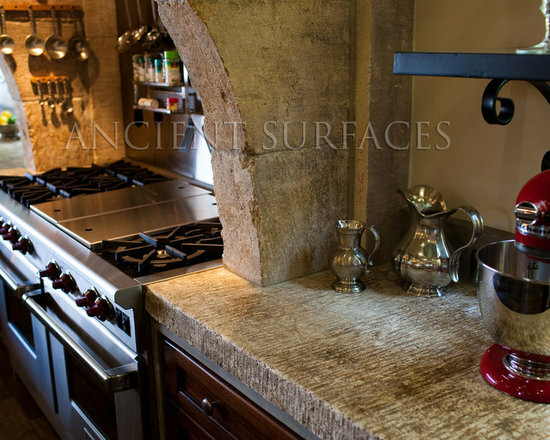 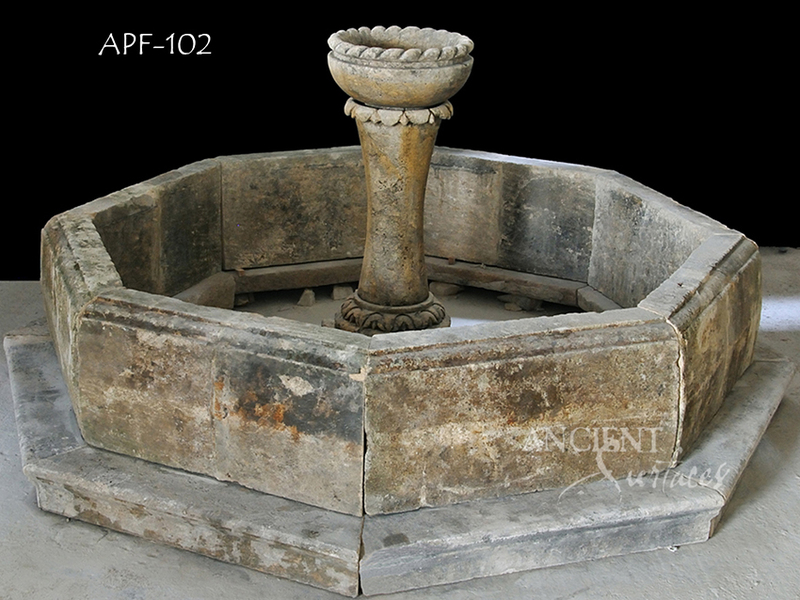 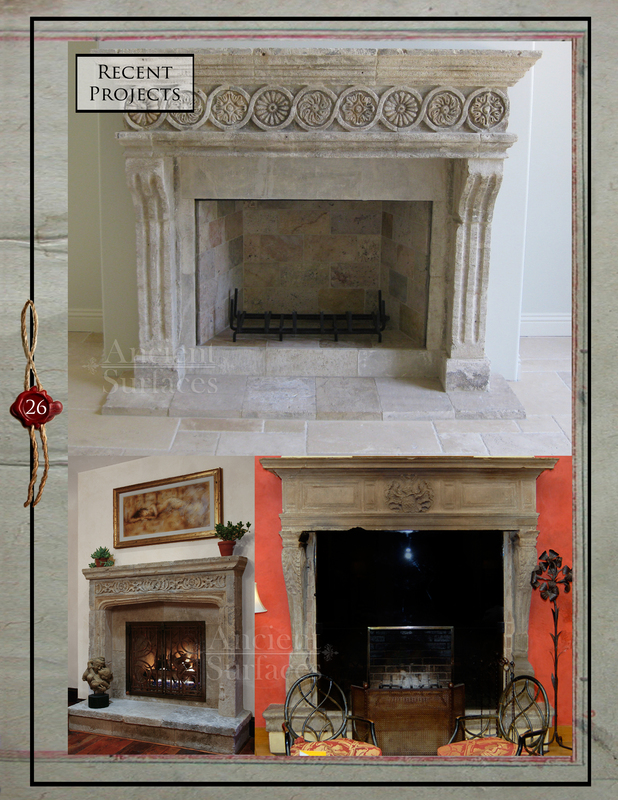 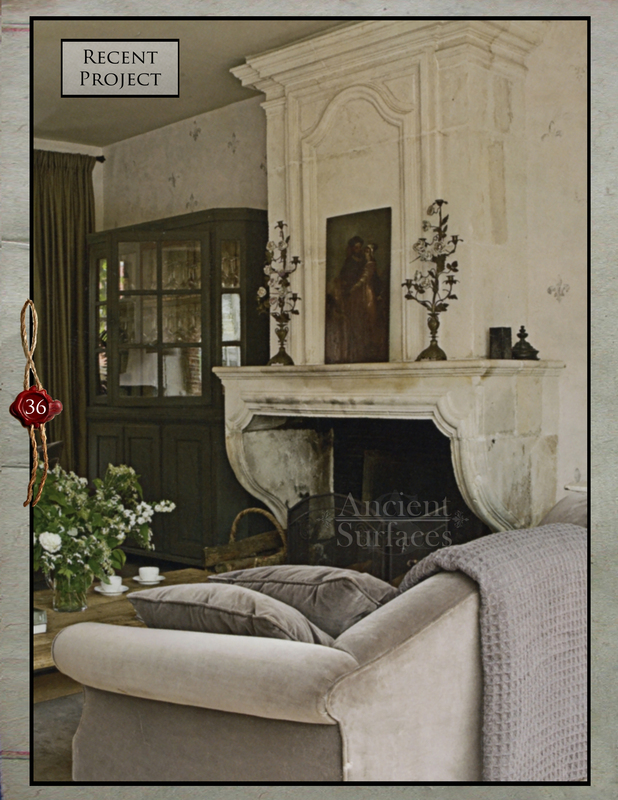 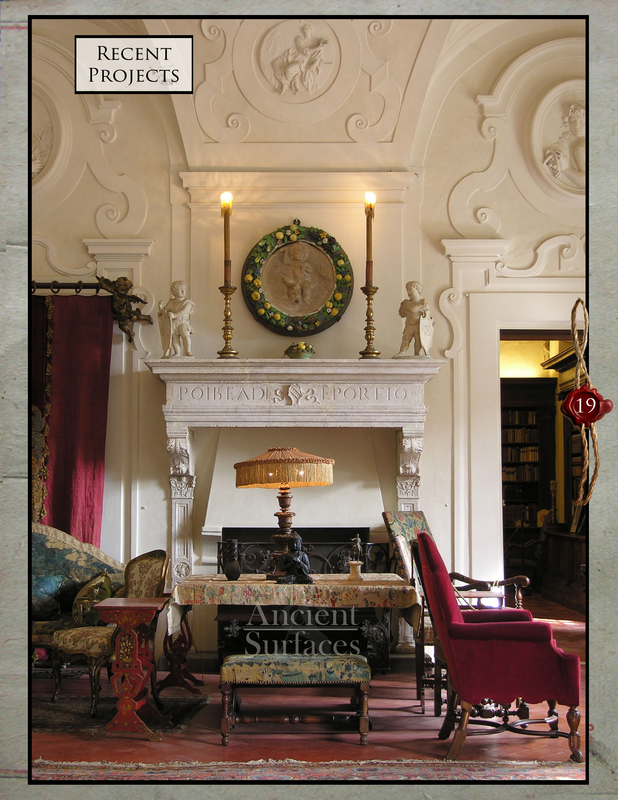 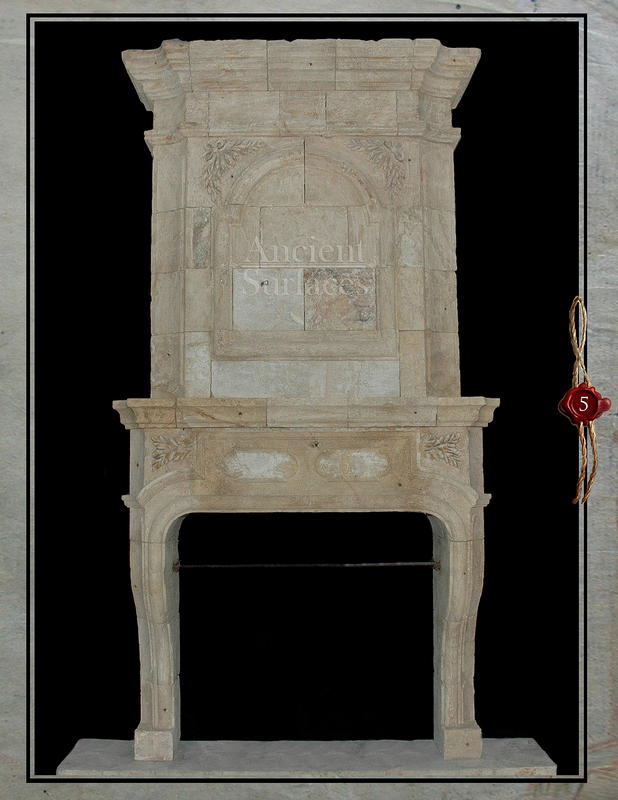 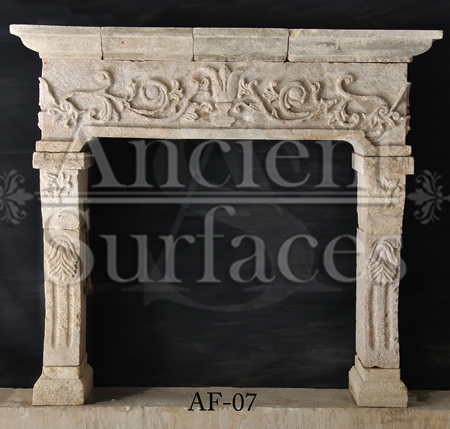 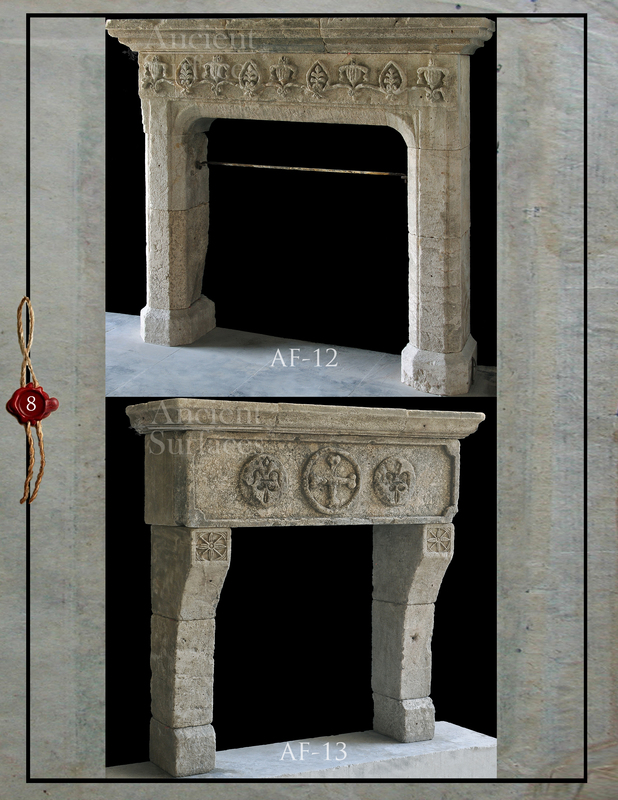 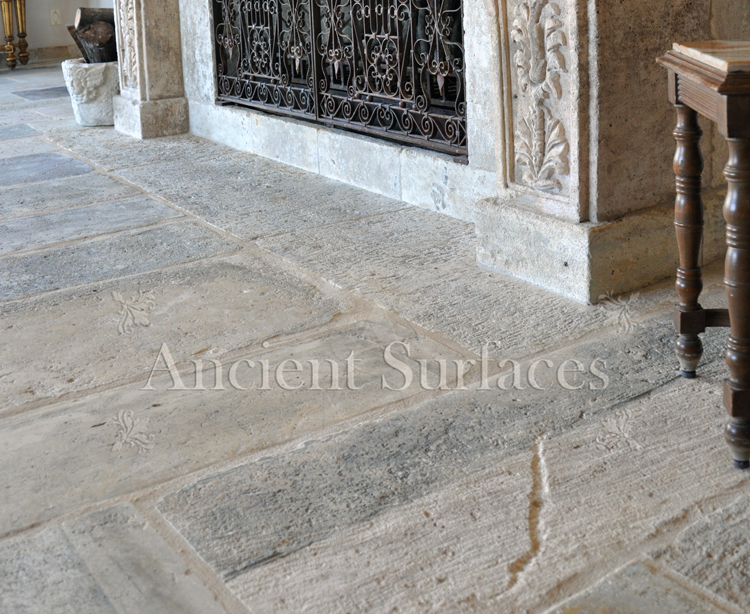 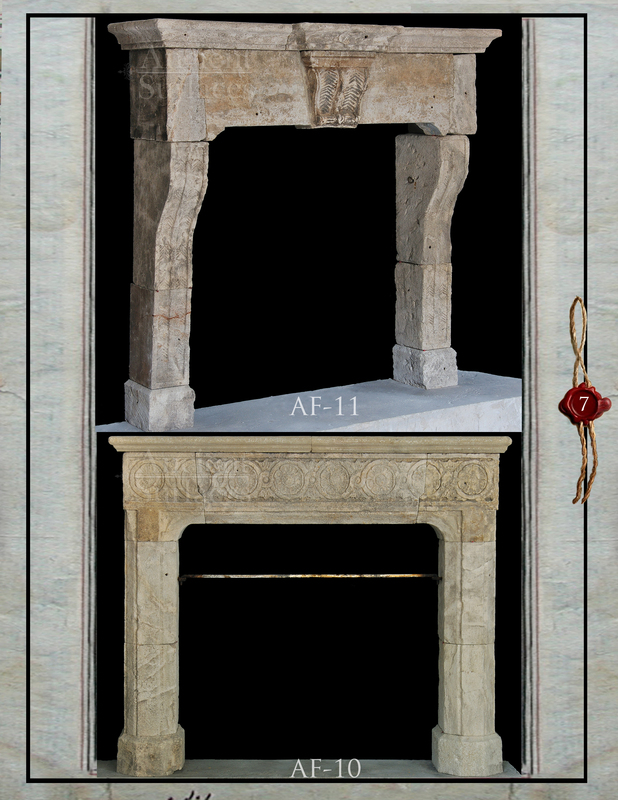 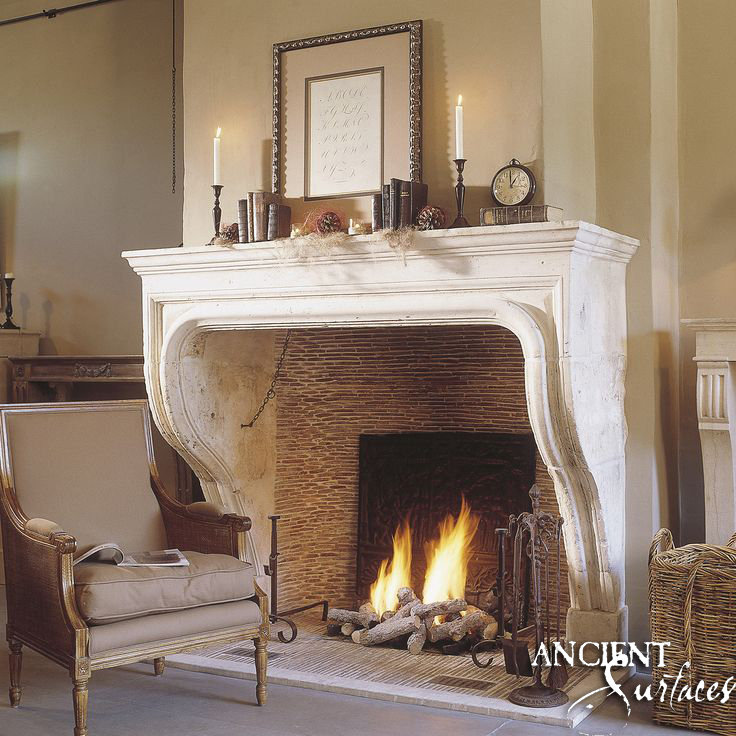 Ancient Surfaces’ wide gallery of fireplaces contains a trove of French and Italian antique limestone mantel fireplaces which is considered by many expert to be one of the world most significant in both size and importance. 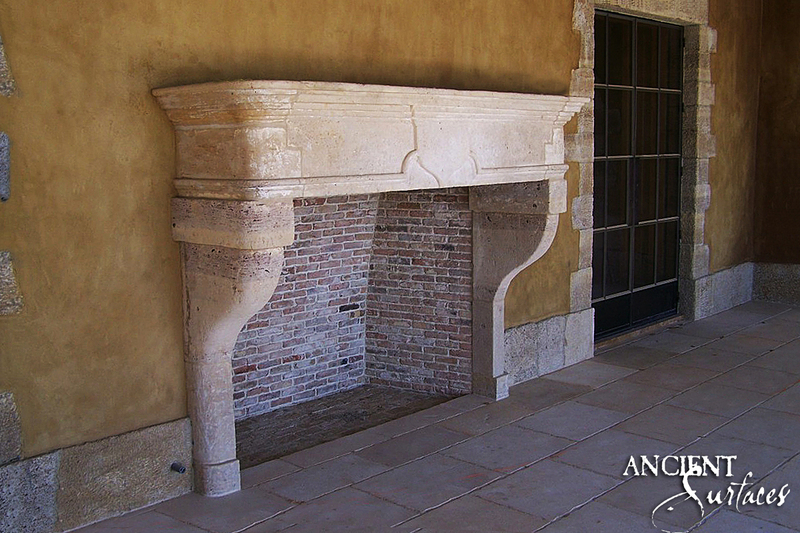 Here’s an antique limestone mantle above was salvaged from France and was raised by a hearth to perfectly fit an existing fireplace box in California. 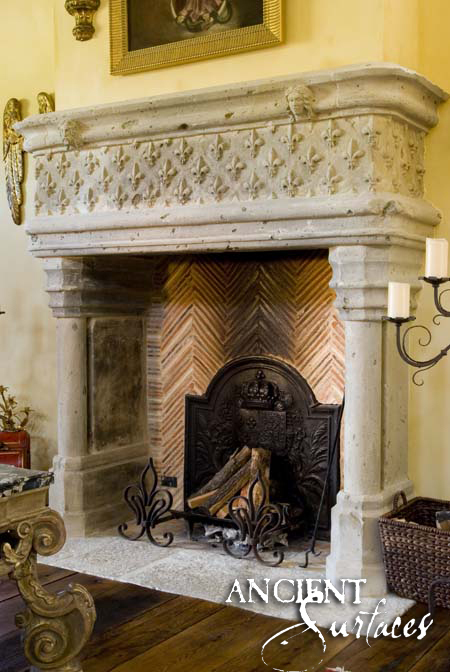 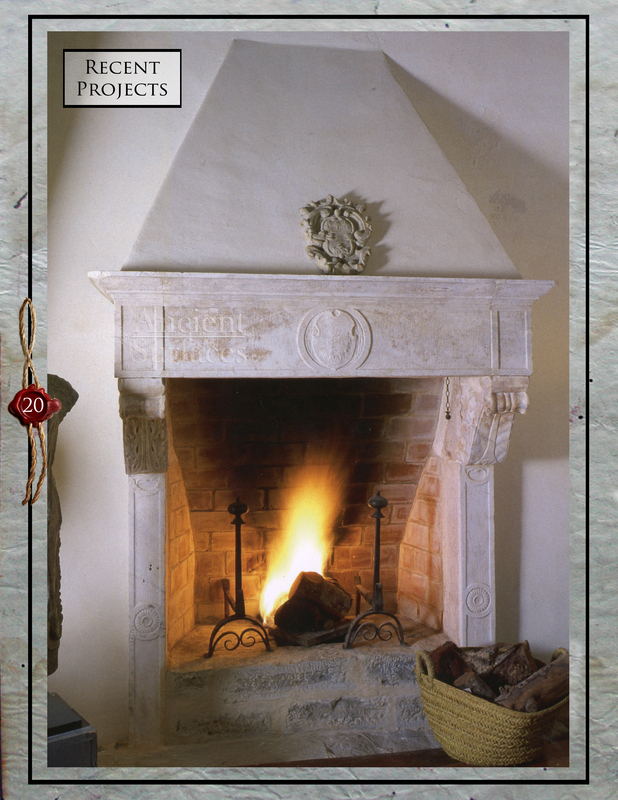 As for the style of mantles goes, the most sought after are 14th to 17th century gems that are Southern Italian, Tuscan or French Bastide also called French Farmhouse of Countryside fireplace which are characterized by their simplicity. 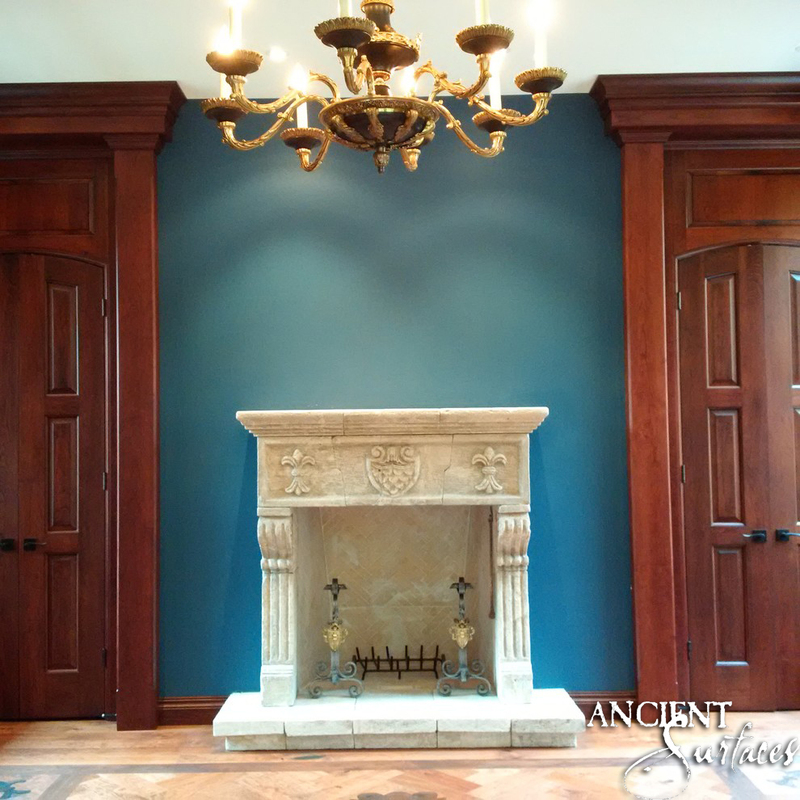 We, at Ancient surfaces, believe that beauty comes from simplicity, we take our time in restoring each original fireplace back to its former glory. 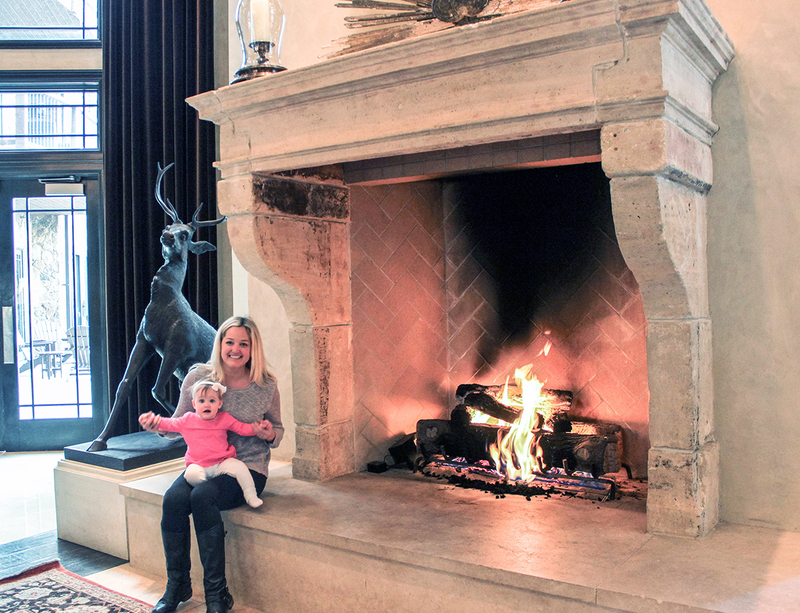 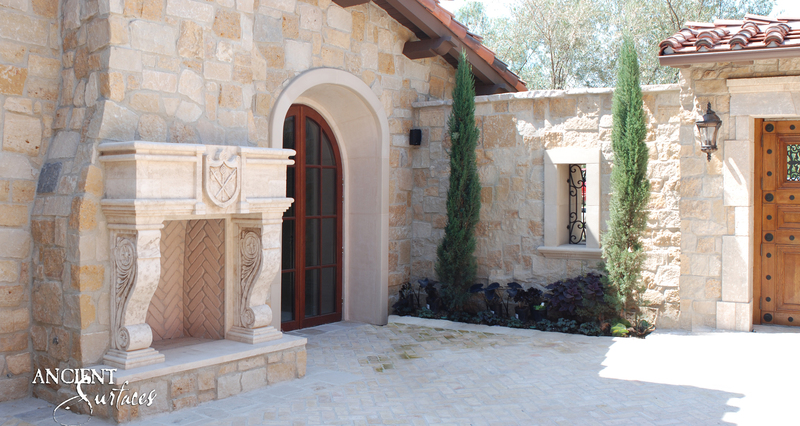 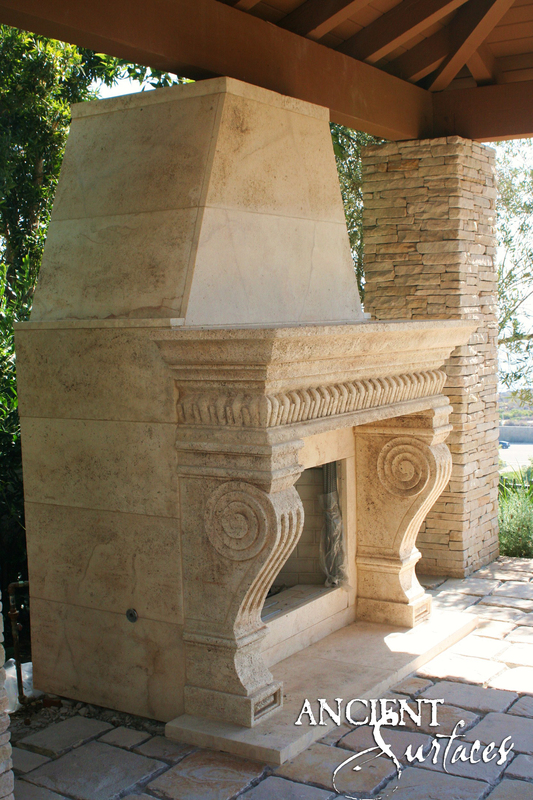 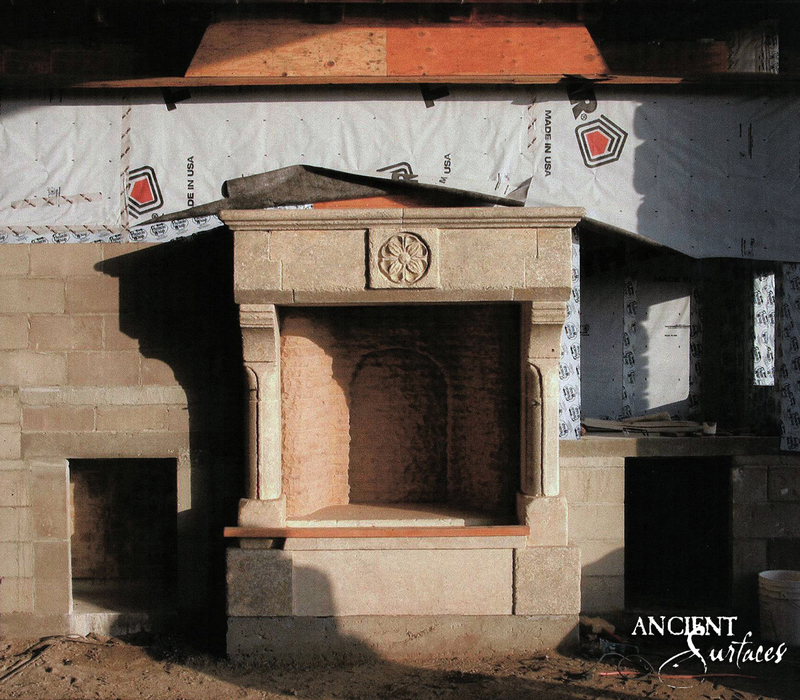 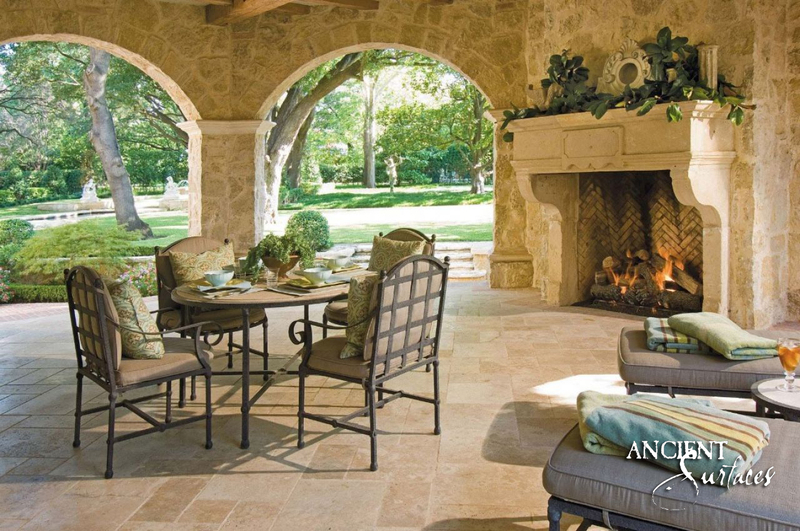 Nowadays, Newly hand carved limestone stone fireplaces are custom tailored to accommodate any firebox opening and can be carved out in any design. 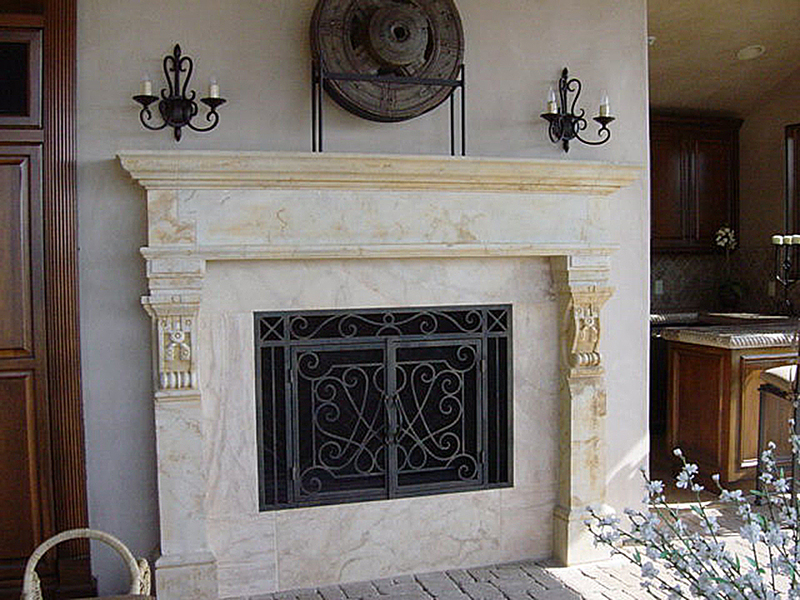 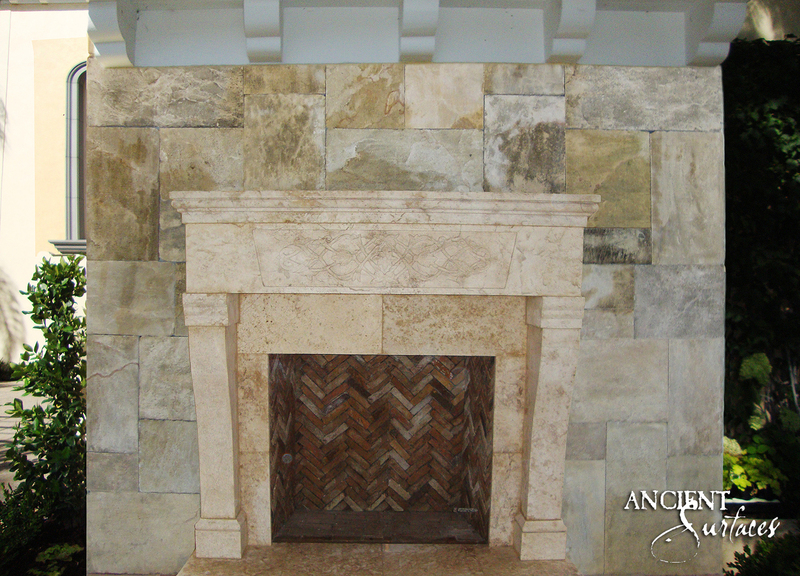 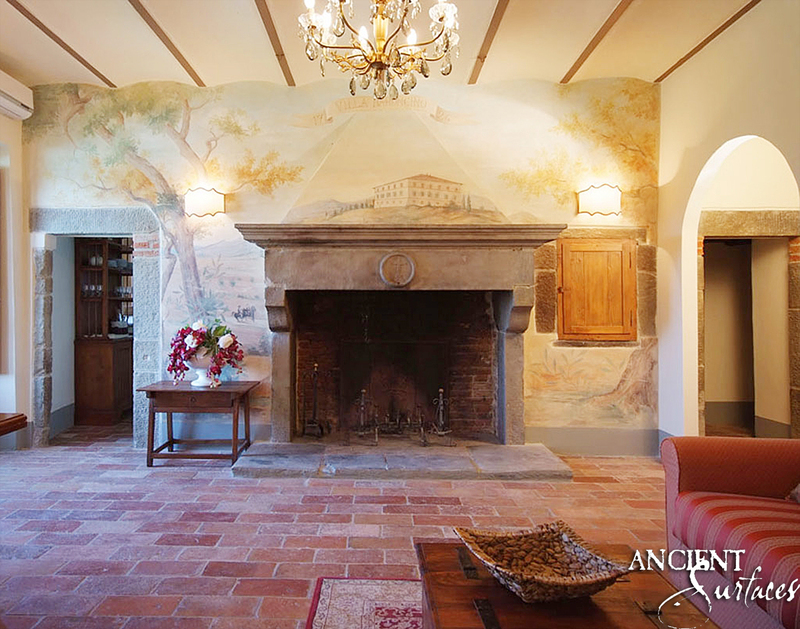 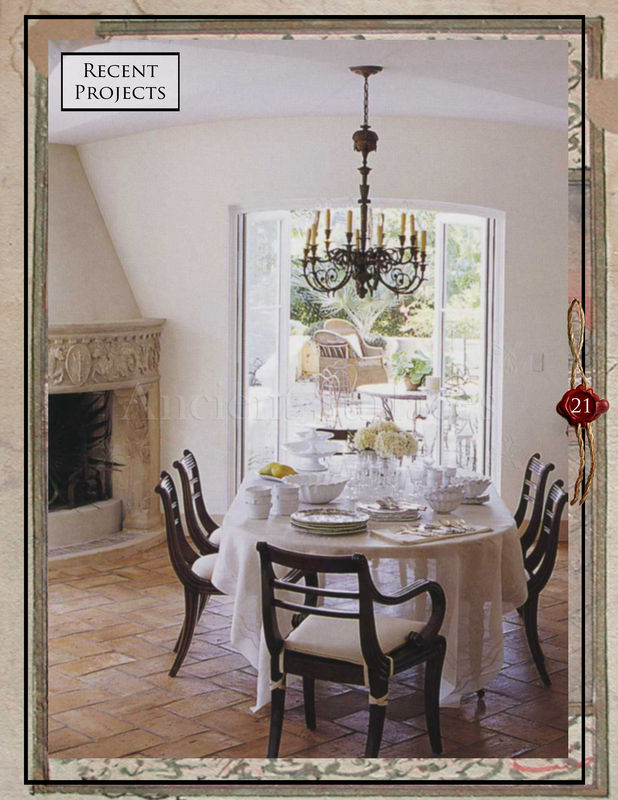 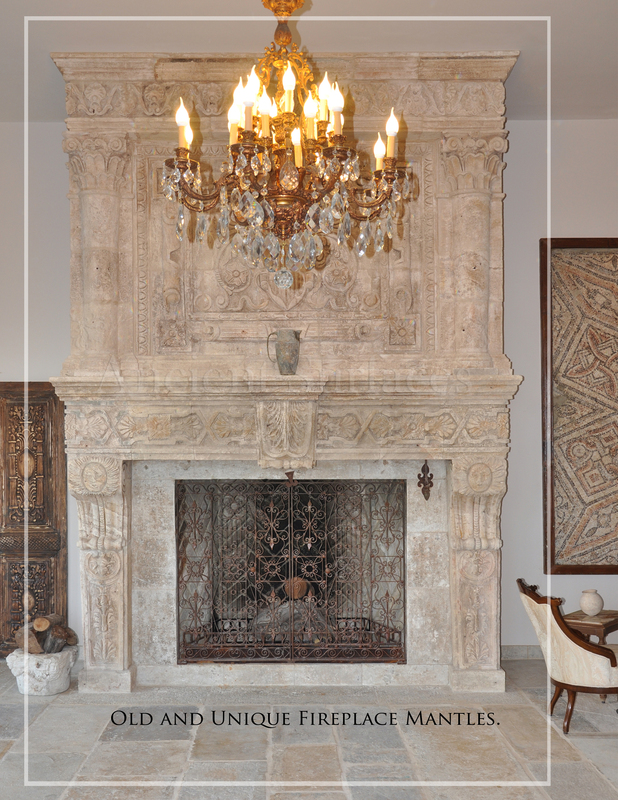 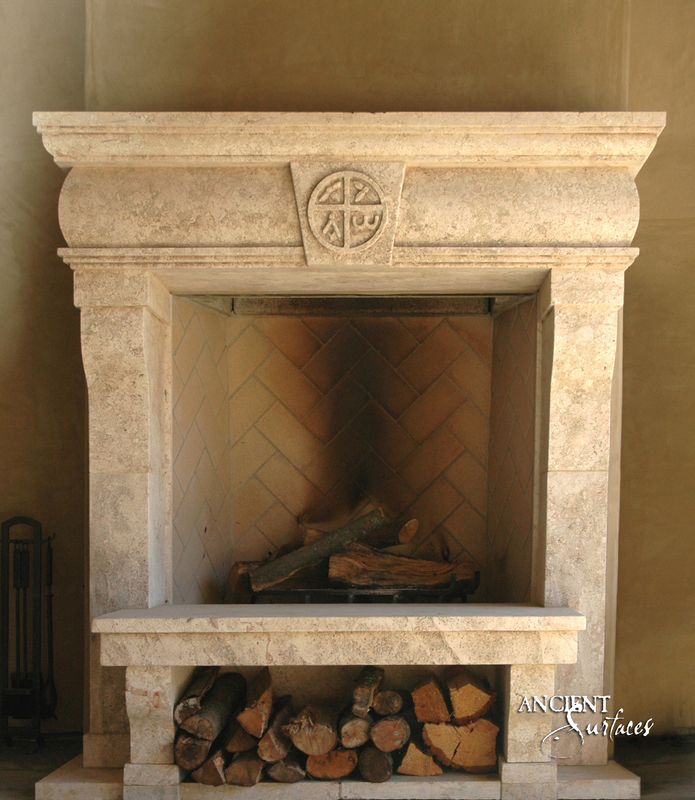 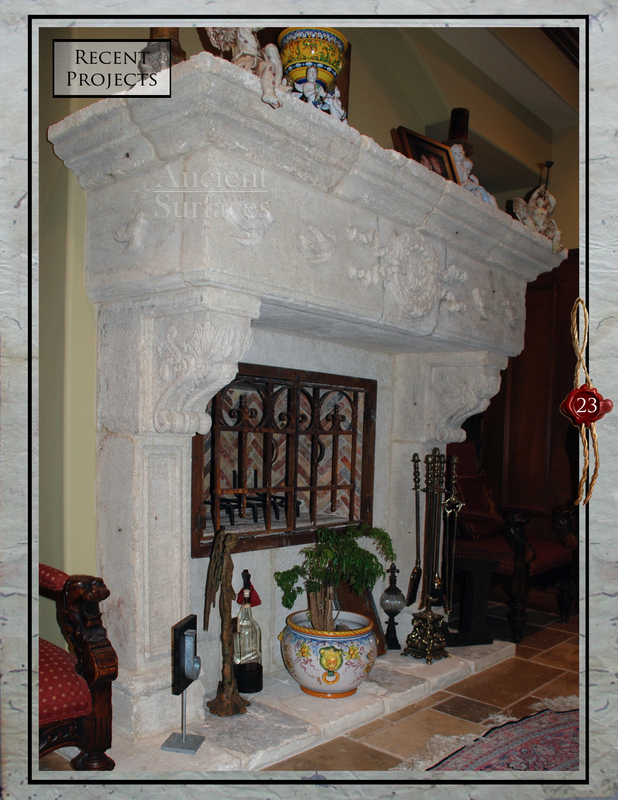 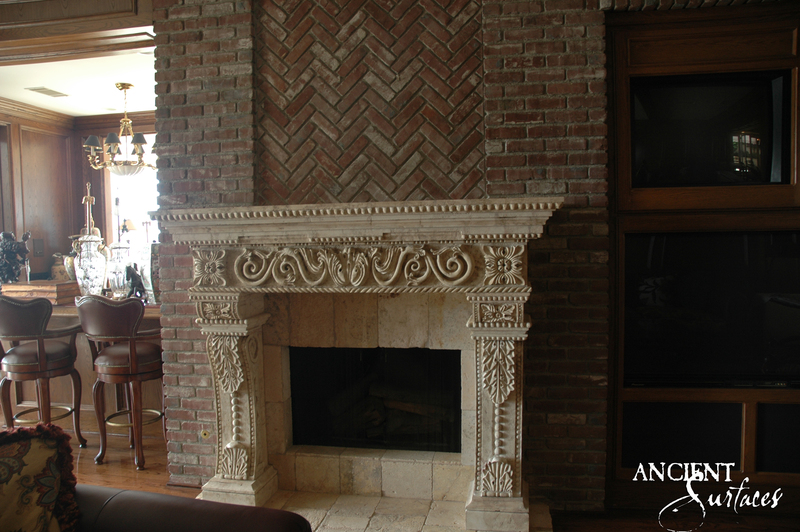 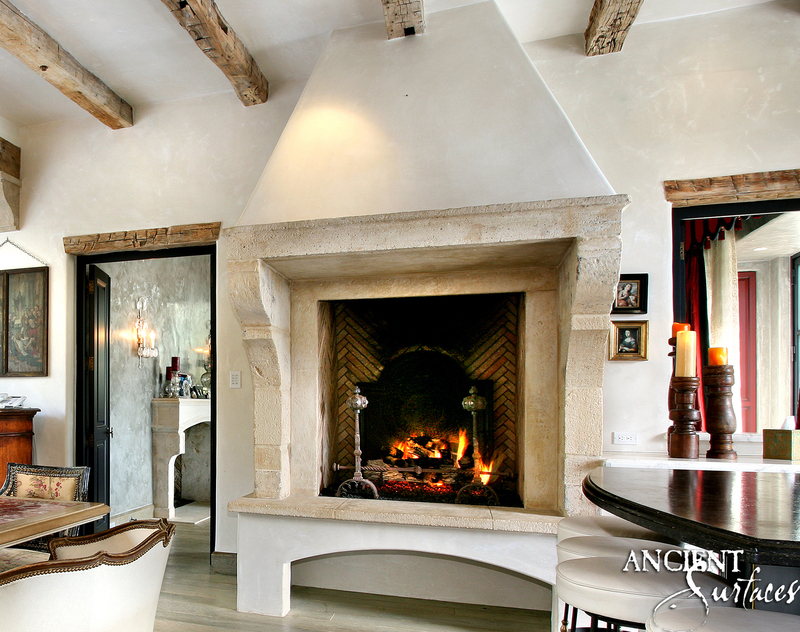 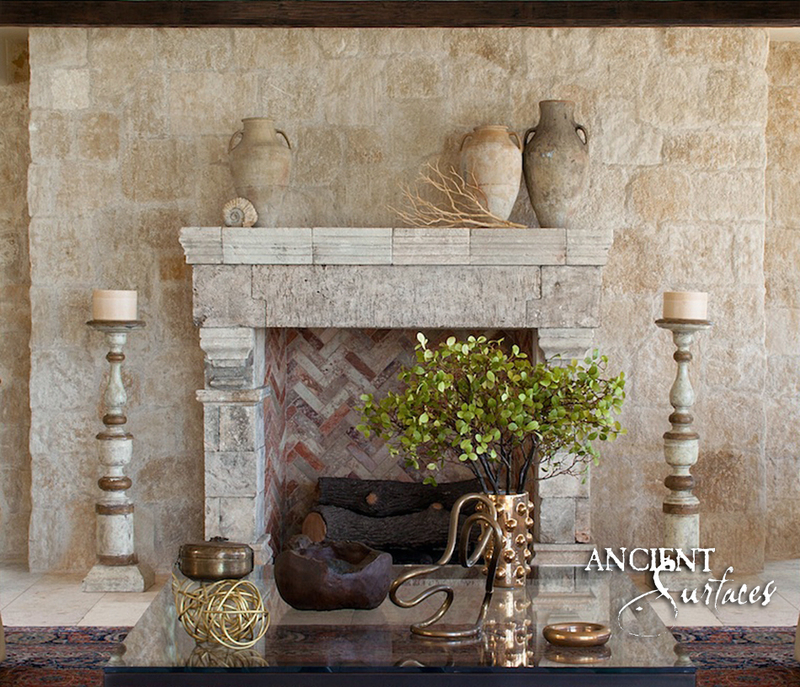 An original Antique limestone fireplace mantle installed in an Italian inspired villa in Southern California. 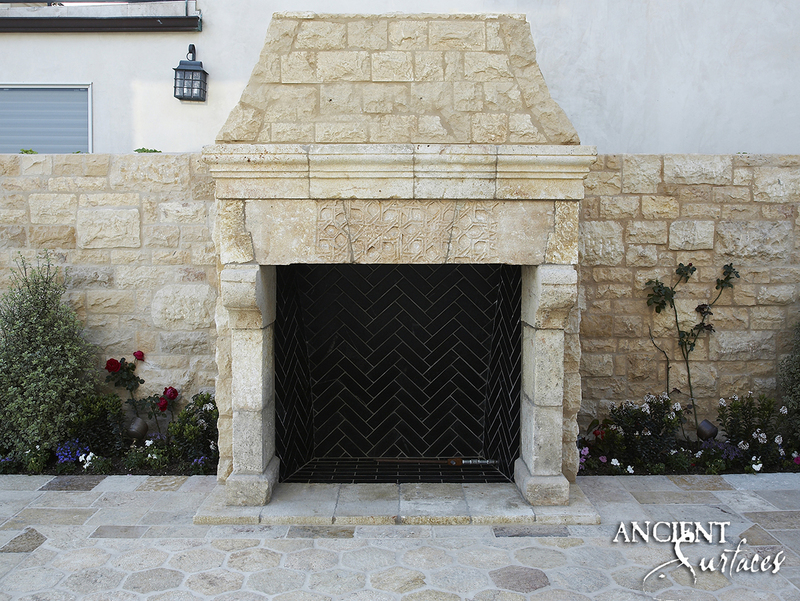 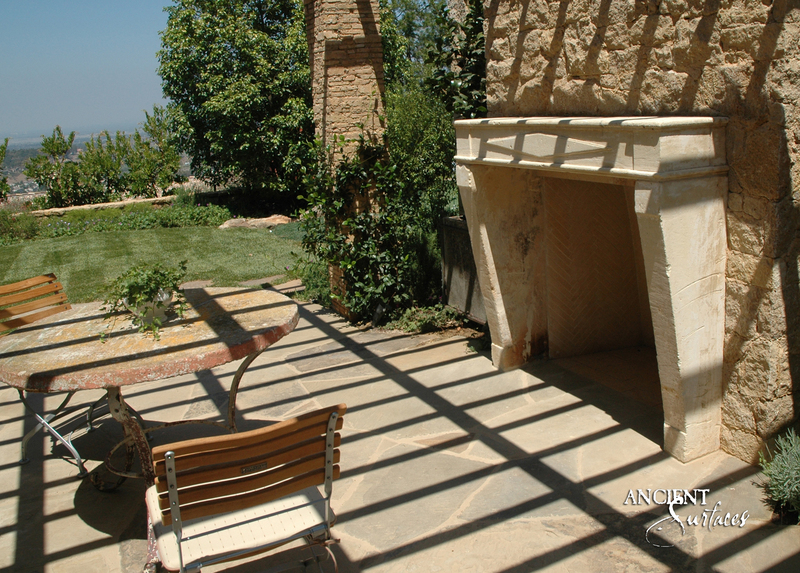 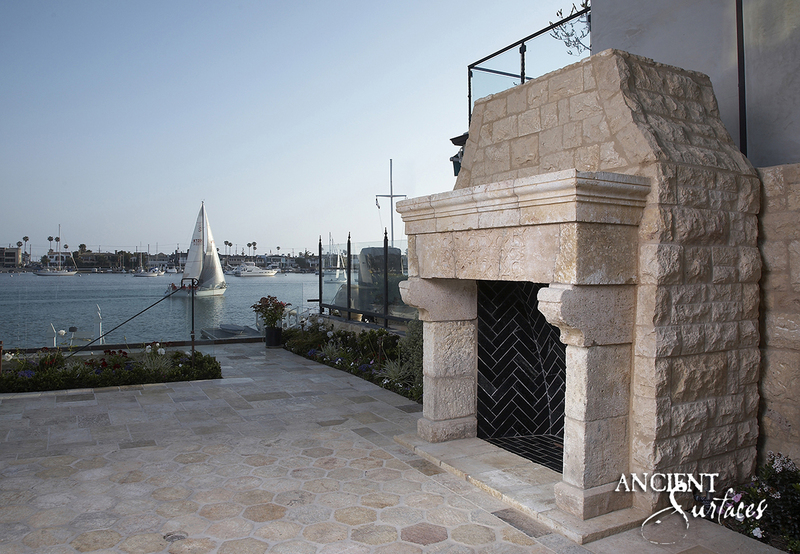 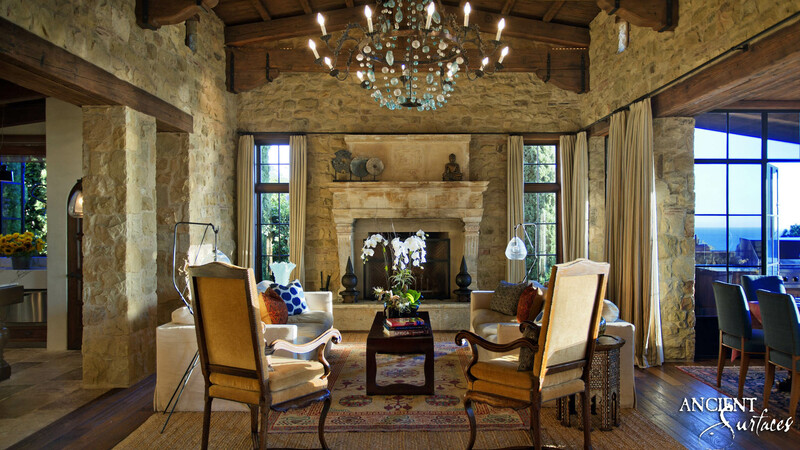 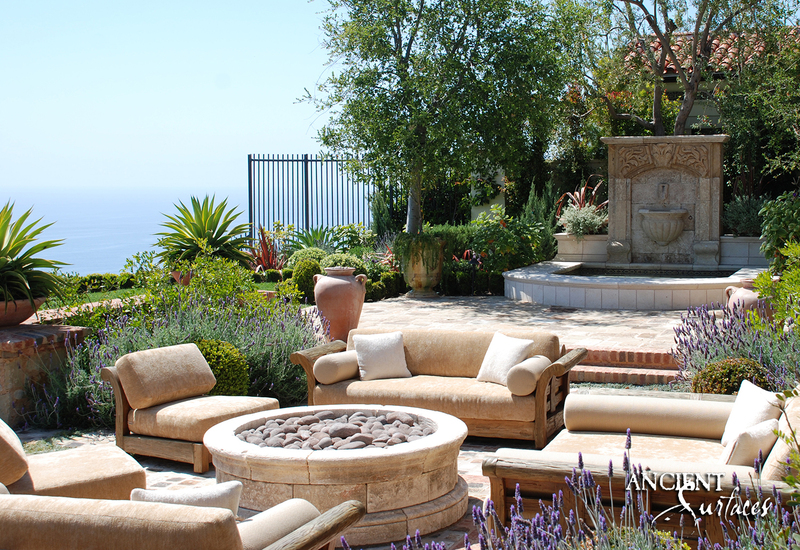 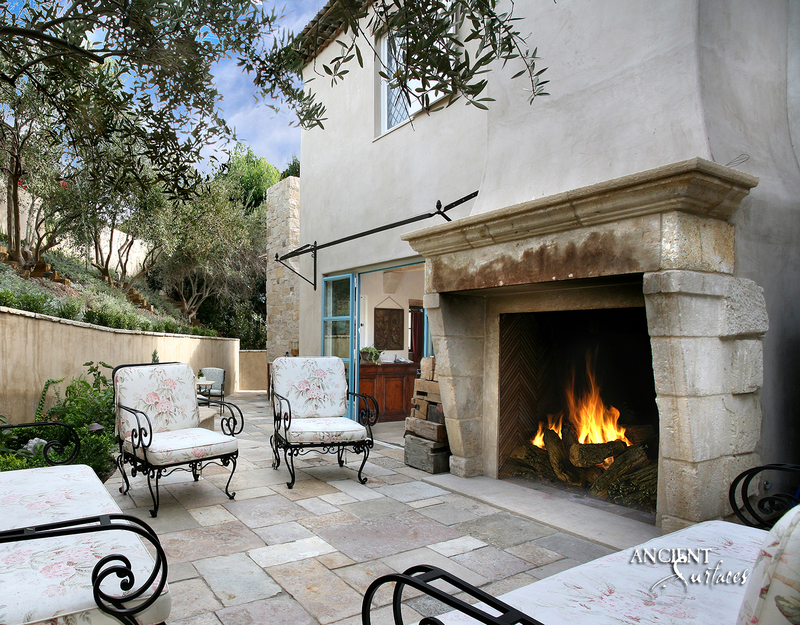 An impressive antique Italian Limestone Fireplace installed in a private home inside an acclaimed gated community in Southern California. 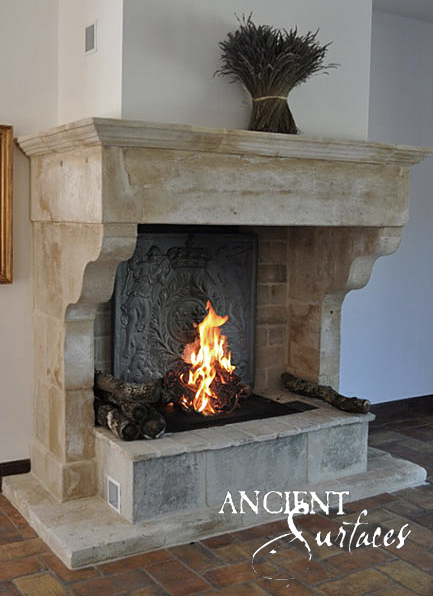 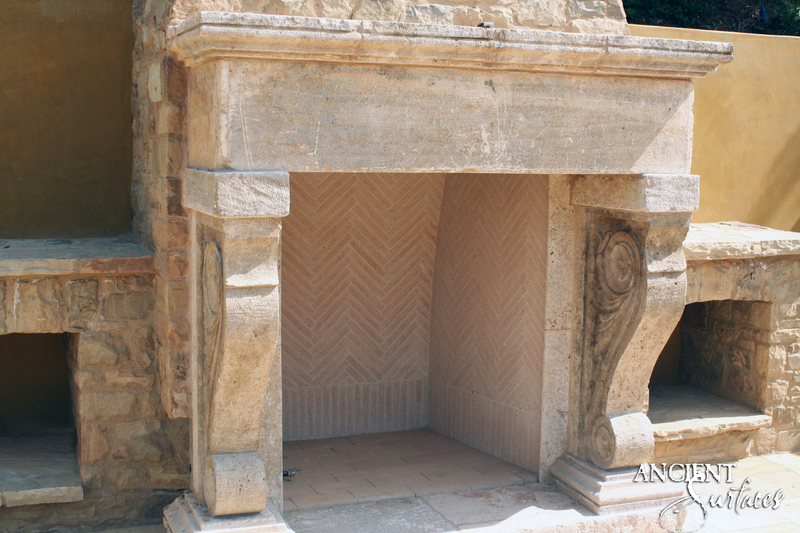 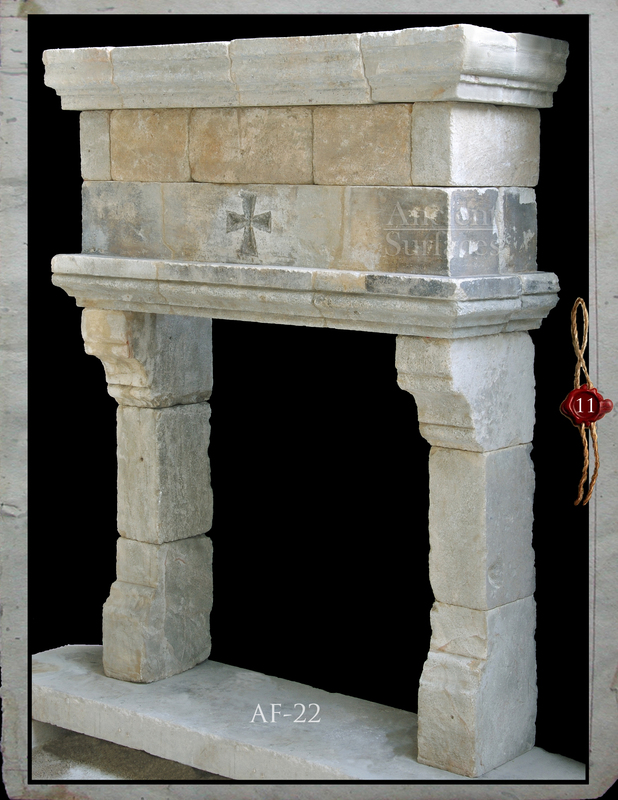 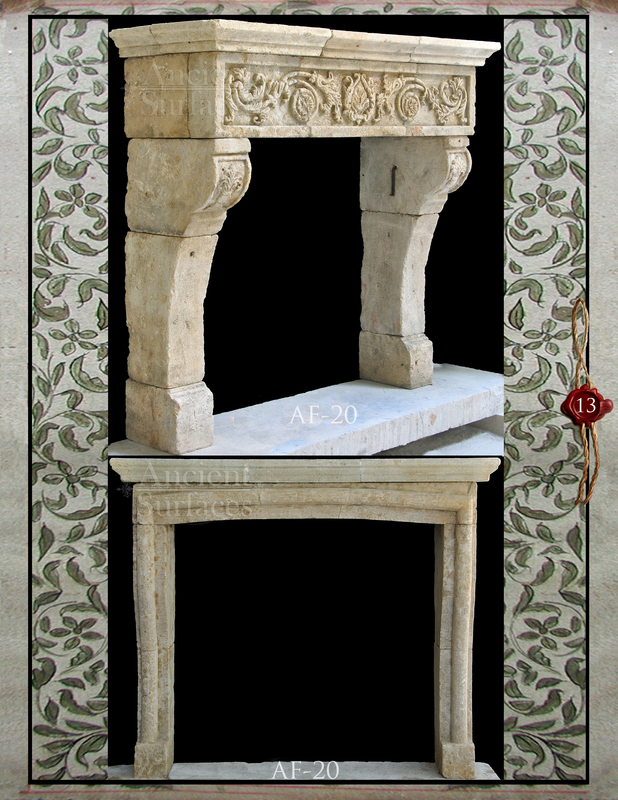 An original ancient Italian Limestone Fireplace fully and carefully restored to its former glory. 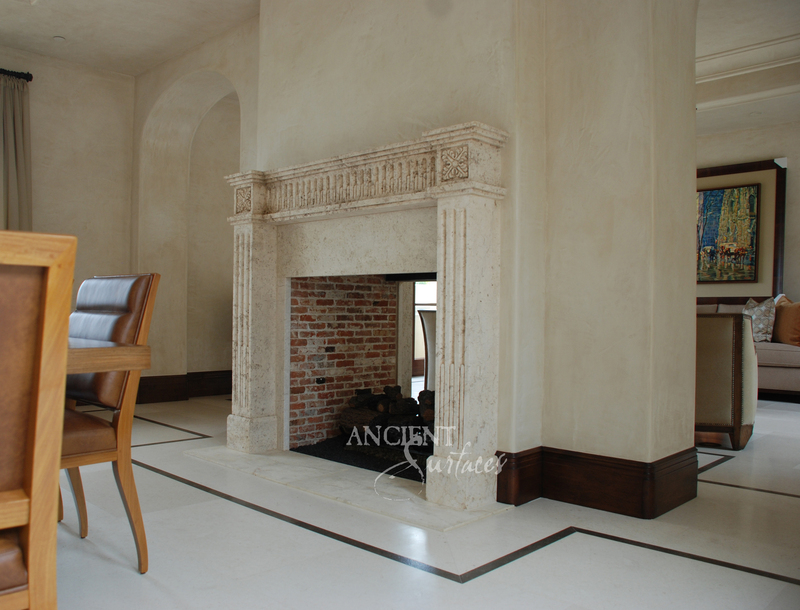 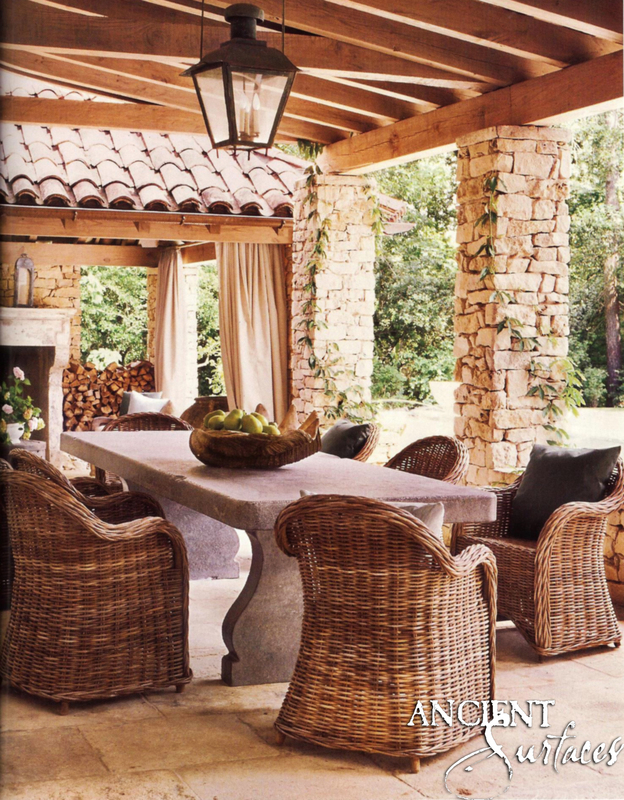 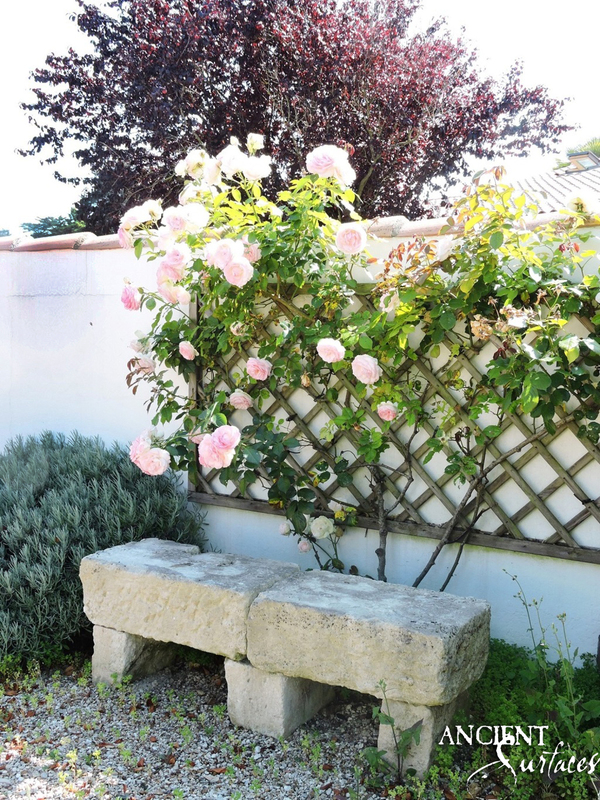 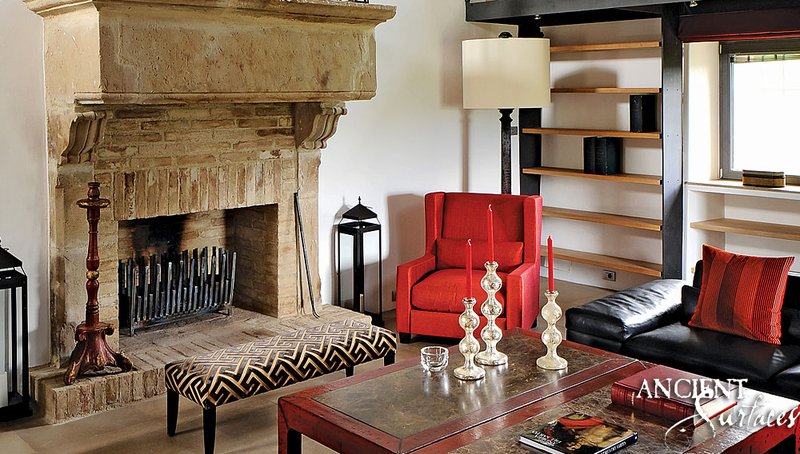 An authentic Italian Limestone Fireplace sitting in situ. 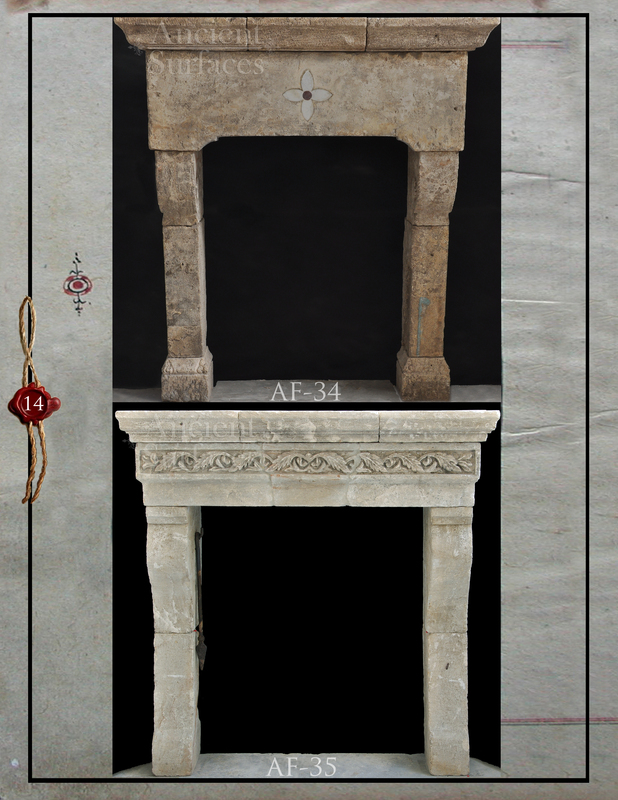 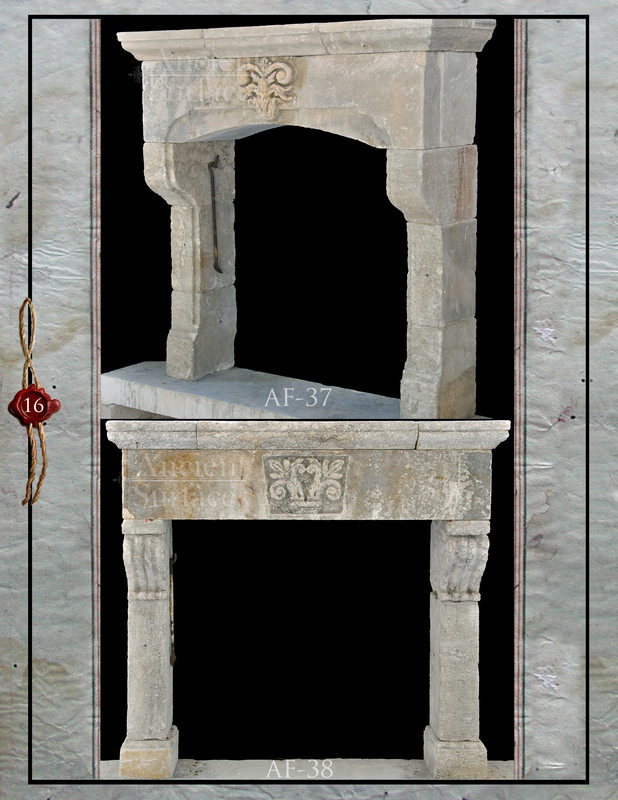 an imposing clean line antique reclaimed Italian Limestone Fireplace.